Every new Marine needs to be trained in a primary Military Occupational Specialty (MOS) ranging from infantryman to airframe mechanic, but there’d be little to separate these technical specialties from a civilian job (OK, I’ll give you infantry) were it not for the foundation of basic military training that ensures everyone from the tank crew to the cook is capable of living up to the title of “Marine” in times of trouble. Although all of the jobs below are listed in the Marine Corps MOS Manual, none of them are considered a primary MOS -- that is, they’re not career tracks so much as temporary assignments. Nevertheless, they’re all key components of maintaining a force in readiness and can provide a refreshing escape from the ordinary for Marines who feel a bit of monotony creeping into their routines. In my experience as a career planner, I’ve even found a few of these jobs useful for spicing up the lives of reserve Marines, who often don’t qualify for exciting changes of scenery like ​​Marine Security Guard duty. Of course, this tops the list of trainers. By no means the end-all of the Corps’ school of hard knocks, DIs are nonetheless the first and most storied trainers Marines encounter and often provide the most lasting lessons. As a special duty assignment, DI duty is limited to certain active duty Marines who meet the strict qualifications to serve as the face of the Corps at the recruit depots of Parris Island or San Diego. The adventure isn’t over once you’ve survived three months at the hands of ruthless DIs (I learned much to my dismay. What was I expecting?) Before moving on to MOS school, all Marines must attend basic combat training. For those headed to the infantry, of course, the Infantry Training Battalion is their MOS school, while others attend an abbreviated version called Marine Combat Training designed to instill basic infantry competencies. Throughout either course, students are accompanied day and night by their combat instructors, experienced Marines capable of training them in the mud and muck on a variety of topics, including basic concealment and camouflage, operating heavy weaponry like the .50 caliber machine gun and anti-tank missiles, and using squad tactics to make it through the night alive. Combat Instructor is considered something of a special duty assignment, like Drill Instructor, but without so many bells and whistles (for example, there’s no campaign ribbon to award three years’ service as a combat instructor, despite years of lobbying from alumni.) Marines must rank at least corporal (E-4) and no higher than gunnery sergeant (E-7) and meet all physical and training standards expected of Marines. The 0913 billet was once limited only to experienced infantrymen, and though this remains true for those at the Infantry Training Battalion, the field has been opened up to competent non-infantry Marines (including women) in order to staff Marine Combat Training. MOS 0913 is also limited to active duty Marines. Ever since the Marine Corps overhauled its hand-to-hand combat system with the introduction of the Marine Corps Martial Arts Program (MCMAP) in 2001, “Marine-Fu” has been a staple of physical and ethical training at every base and station in the Corps. As such, organic trainer staff is necessary almost everywhere you’ll find more than two Marines banging their heads together. 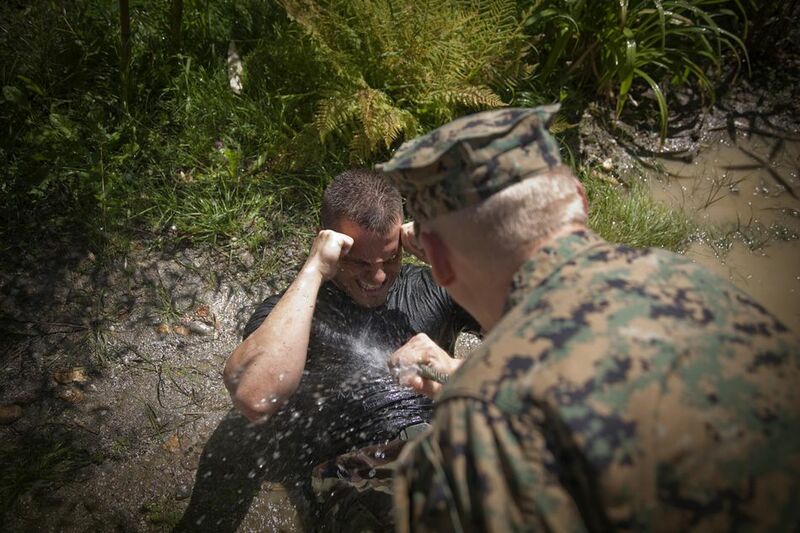 All Marines are now required to qualify in MCMAP at the ground level -- tan belt -- in boot camp. In order to become instructors capable of conducting training for tan belts and gray (2nd level) belts, Marines must themselves have a gray belt as well as finish professional military education required of their current rank, such as Corporal’s or Sergeant’s Course. They may then begin training in a Corps-approved course that cranks out MCMAP instructors. After at least six months as an instructor, Marines at or above the rank of sergeant (E-5) and possessing a green belt may go on to become Instructor-Trainers, whose job it is to train Marines for higher belt levels as well as train new MCMAP instructors. They face stricter entrance criteria, including a top physical fitness score and no history of surgery or broken bones for at least half a year, and must attend a seven-week course at Quantico, VA.
Everyone needs MCMAP instructors, including reserve units, making this training MOS a great opportunity for Marine reservists to get outside their comfort zones.